You've just about marked off all your Christmas Gift List and you've checked it twice but isn't there a certain little pooch that deserves a treat on the big day? Yes your furry four-legged friend who greets you like you've been away for a year even though you only nipped down to the shop for milk is one loyal little pal and this little pal deserves a treat just like the rest of us. 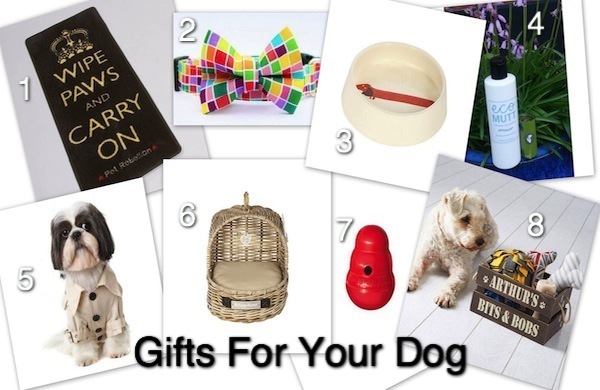 Here are some of my favourite gifts you can get for your dog. More a gift to yourself than your pet, this floor mat from Pet Bliss, an Irish based online Pet Shop is perfect for soaking up the wet from your pooches grubby paws, especially during the wet and possibly snowy winter months. Why shouldn't your dog eat in style? After all I'm sure you'll have the good china out for dinner on the big day. Brown Thomas to the rescue for some designer dining for your dog! Where do I start on this? Irish and handmade from 100% natural soap. This eco friendly dog shampoo from ECO MUTT is paraben, toxin and sls free and all because your dog 'is worth it'. My own little dog Charlie would look adorable, verging on distinguished, in this little coat. Brought to you by Molly's Pet Boutique, an Irish based online Pet Shop. Definitely not suitable for large dogs, or those who like to chew things, this gorgeous little doggie bed is brought to you complete with a hanging heart mobile from the Irish designer mecca Brown Thomas. The Kong Wobbler not only provides entertainment for your dog as it dispenses treats while your dog plays with it, but it can give you a bit of entertainment too as you observe your dog doing his best to get to that goodie. Another product from Molly's Pet Boutique. I love this personalised crate from Rose Cottage who feature on the ever-expanding small business promoting UK-based online store notonthehighstreet.com - check out their store for more pet inspired and personalised gifts. For those of us not blessed with a little pooch or mutt there is no reason why you can't give a little this Christmas or in fact every Christmas to those little doggies who deserve some love and attention too. Check out the ISPCA for great ways to show your support. I particularly love the gift idea called 'Feed a Dog for a Month' and it will only set you back €25.00. If it's a keepsake you are after then the Irish Guide Dogs for the Blind have an adorable 'Life is Beautiful' calendar that costs €8.00 which will brighten those cold wintery months ahead.